1. Cut zucchini and cauliflower in small chunks and cut cherry tomatoes in half. Place on parchment lined baking sheet, drizzle with 1 tsp olive oil, and bake at 400 for 30-35 minutes stirring half way through. After removing from the oven, reduce heat to 350. 2. While vegetables are roasting, heat 1 tsp of olive oil in a skillet over medium high heat. Once hot reduce heat to low and add thinly sliced onions. Cook until caramelized, 10-15 minutes. Remove from heat and set aside. 3. In the same skillet as you cooked the onions, add 1 tsp of olive oil and heat at medium high heat. Once hot, add the cubed chicken breasts and cook until cooked through and browned on all sides. Remove from heat and set aside. 4. Spray the pan with cooking spray and add sliced mushrooms and the chopped bell peppers. Toss and cook for about 1-2 minutes then add chicken broth. 5. 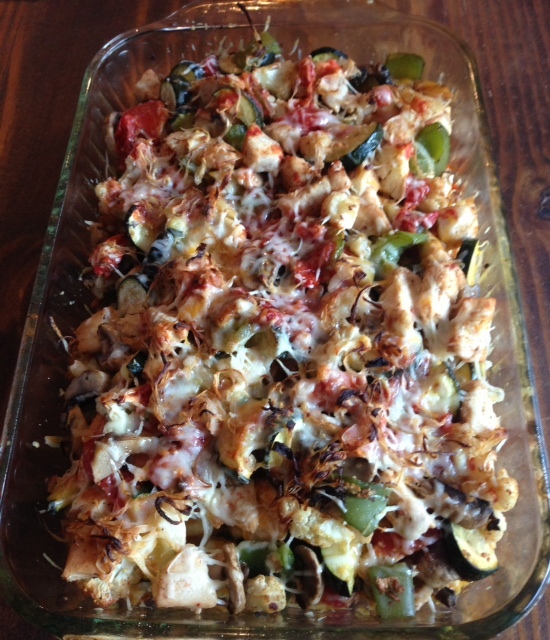 Turn off heat and add browned chicken and roasted veggies to the pan with the bell pepper and mushrooms. Stir until well combined. 6. Place 1/3 of veggie and chicken mixture on bottom of 9 x 13 inch greased baking dish, next top with a 1/3 of tomato sauce, and then top with cheddar cheese. Continue this layering process, but the second layer put the mozzarella cheese and on the top place the Parmesan and caramelized onions. 7. Bake at 350 for 20-25 minutes until cheese is melted and top is golden.